Version control: This document is current with respect to drug indications in the 2015 American Heart Association® Guidelines for CPR and ECC. These guidelines are current until they are replaced on October 2020. If you are reading this page after October 2020, please contact ACLS Training Center at support@acls.net for an updated document. New! We now sell a laminated checklist that you can keep on the crash cart for reference. Any environment in which a patient may unexpectedly experience a medical emergency needs to have the equipment to deal with that emergency efficiently. That’s the job of a crash cart. A crash cart contains the equipment and medications that would be required to treat a patient in the first thirty minutes or so of a medical emergency. Although crash carts can differ somewhat depending upon their location, the basic crash cart will contain similar equipment. Who needs a crash cart? Any facility that treats patients who have the potential to have a sudden deterioration in their condition should have a crash cart available. State regulatory agencies require certain facilities to have a crash cart, but they are recommended for many more. This would include hospitals, outpatient surgery centers, urgent care centers, and all centers where conscious sedation is performed. Nursing homes who provide treatment for patients in cardiac arrest until EMS arrives would also have a need for a crash cart. Physician offices who perform certain diagnostic testing such as cardiac stress testing or stress echocardiogram also must have a crash cart available. Intravenous access equipment (or intraosseous) including angiocaths, IV tubing and IV fluid. If the facility elects to utilize intraosseous access for emergency medications, then a drill and needles must be included. Medications utilized in the treatment of cardiac arrest including epinephrine and amiodarone. Medications utilized to treat cardiac dysrhythmias including adenosine, cardiazem, a beta blocker (usually Lopressor®), and Atropine. The worst thing ever is to reach for a piece of emergency equipment or an emergency medication and find it inoperable or expired. It is important that the crash cart be checked regularly and maintained so that its contents are there when needed. State/provincial departments of health may amend these requirements. We are aware of the following local requirements. Supplier for anesthesia and respitory equipment with name brand products and wide selection. This is a small women-owned business with particular attention to customer support and they can help you pick the products you need. Mention ACLS Training Center for special pricing on your first order. All drug items listed here are available from Boundtree with no account minimums. Mention ACLS Training Center for 10% off your first order. I have a quick question. Does it matter where the crash cart will be located, hospital vs nursing home, whether or not Narcan should be on the cart? I don't know if the regulations are different? I can't seem to find anything that states there is a difference, so I figured I'd ask you. Thank you for your time. for the state of Illinois. Rashmi R.
Narcan should be on the cart anywhere there is narcotic use. Overdoses are very common in nursing care facilities and so they must be equipped to respond. Hi I have a question regarding neonatal crash carts and equipment. 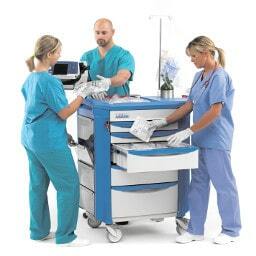 My understanding is the Broselow crash cart is for Pediatric patients, wherein we can have less than 3 kg neonates. Is there a new development on it’s content ? Appreciate your feedback. Faye C.
There is a new Broslow tape. You are dealing with neonates, totally different issue. My name is Jacqui, I am the nurse manager for Marklund Community Day Services in Geneva, Illinois. I am trying to update our crash cart and make sure we have all the necessary equipment and supplies that are legally required. Our facility provides care for community clients with developmental disabilities as well as our long term clients. Are the requirements the same as what is needed in a hospital setting or is there a difference? What is required for our facility? - Jaqui O., RN. Requirements are defined by each individual states. Most do not list individual equipment but rather require that equipment be available to respond to potential emergencies for your practice. Hello, I have a question, I work in a geriatric clinic as a certified medical assistant along with five RN’s and one LPN and just recently my director of nursing decided to delegate the responsibility of the crash cart to me and another MA. Is this ethical and following state regulations? I do not have the credentials, training nor ever seen a crash cart before coming to the clinic. Could you send me regulations or some guidelines stating who’s responsibility it is to manage the crash cart in the state of Oklahoma, please? I want to share this information with the clinic and director. - I’neisha R.
Checking the crash cart (I assume that is what you mean) is simply checking expiration dates and assuring that the contents are complete. This can be done by anyone. It does not require any type of license or certification. We are going to have Jhaco in our facility soon. The list that you have on your website. about the medication and equipment needed in the ACLS(Crash Cart)Cart ,are they approved Nationwide? If not how can I know what are the approved meds and equipment needed for our crash cart in our center which we are base in Michigan. Adrian S. Lead Nurse Pre Post. I work at a family practice office in ga. We are trying to update our crash cart I got the check list off your site but I have a few questions. It only needs to be locked to secure narcotics. There are no LEGAL requirements for crash carts. Just that you must be equipped to deal with emergencies that may reasonably be encountered in your practice. I.e, respiratory arrest with sedation, etc. if you utilize a plastic seal the standard practice is to check the cart when the seal is broken and to break that seal at the end of each month to check for each spiration dates on medications. Your practice could differ, but that is pretty standard. I had a question regarding crash carts. I was reading the information from your link below. Can you provide me with any billing guidelines or direct me on how to bill for crash cart services in an urgent care or office setting? Your assistance is greatly appreciated. Liza, M.
The level of care would increase. I am not aware of any direct billing for “crash cart services”. Hi I have a few questions. I’m a dialysis nurse working in a clinic providing dialysis for patients. Our crash cart has an AED, oxygen and suction. It also has some ACLS drugs on the cart. I’m new in this setting as my previous experience is hospital settings. I have my ACLS certification. What would be the barriers to providing ACLS in a clinic setting like this. My concern is that we do not have a way to see rhythms, no way to intubate or any nurse with actual experience in intubation (respiratory or physicians have done this in past codes I’ve participated in) so we should not use the drugs in the cart? I’m just trying to find the legal answer to this situation and make recommendations regarding the epi and other drugs in the cart. If you could help or tell me who to contact for this information. Lastly, does a physician need to be present or at least contacted if ACLS drugs are needed? I've been reviewing your responses to questions on your Recently Asked Questions page (https://www.acls.net/acls-crash-cart-faq.htm) and it is very helpful. I was wondering if you could answer a question of my own. I noticed you say that if an office is performing conscious sedation they are required to have a crash cart. I was just wondering where these requirements can be found? In other words, what authority states an office performing conscious sedation is required to have a crash cart? I'm in California. All the best and thanks for your great work, Tom F.
The requirements are different in each State. However universally all licensing bureaus require the office/hospital/medical center who performs sedation to be equipped to deal with any and all possible complications arising frim that sedation. Although you could equip your office with appropriate medications, defibrillator and equipment and no store it technically in a “crash cart” this is the most accessible and standard way to do it. Our liability as medical professionals lies with Meeting and be compared to the “standard of care” within our speciality and so it is safer from a liability standpoint to conform to the mean. I hope this helps. I would like to know, are infusion centers required to have full crash carts? Also, are there any regulations on what types of infusion medications require full crash carts? -Lovedeep, S, Regulatory Specialist. There are no specific requirements for “crash carts”. What most State guidelines require is that you are capable of responding to any emergencies “that can reasonably be expected in your delivery of care within your practice.” So that will differ depending upon the type of care that you render. 1. Why aren’t interosseous devices a crash cart requirement when they are potentially so crucial to delivering meds? 2. The use of the term “drill” with regard to interosseous makes it sound like a battery operated/ electric type drill is needed for interosseous needles. However, manual type devices are just as effective and don’t run risk of batteries being depleted. Is there a requirement that IO needles be accompanied by a “drilll” that is battery powered? Or are manual IO placement devices acceptable? There are NO requirements for crash carts as the needs depend upon the the facility. Manual IO devices have not been used for ten plus years. The old Cooks and Jamshudes could be put in manually. The new IO needles are completely different and can only be put in with a drill. They can be put in shoulders, legs and a number of ither sites. The manual ones were way more traumatic then the newer drills which is why no one uses them any longer. When checking crash carts, must we unplug the cart prior to manually checking the defibrillator? There is some discussion about this in our department. We would like to all be on the same page. If the Defibrillator is plugged into the cart then either unplug the cart or the defibrillator. It is the definition batteries you are checking. Could you please advise me of the laws or regulations applicable to Urgent care walk in clinics in New Jersey in 2014 regarding requirements for a crash cart? Angel D. Arseneault & Fassett, LLP. I would have no way of knowing guidelines and regulations for your State. Laws do not govern crash carts. It is State DOH recommendations and JCAHO guidelines that are usually followed. All requirements for crash carts are defined by whatever your regulatory body is. They are different by State, by governing body (i.e., DOH vs JCAHO). There is no blanket requirement for presence or placement of crash carts. Does the strap that hold the oxygen tank onto a code cart have to have a special approval or rating for use or can any non-approved substantial strap be used? Robert P.
It must hold that tank. There are no specific guidelines other than safety. Should our hospital defibrillator be plugged into the charger 24/7 or we can just keep record of the battery condition and charging time? Yes, defibrillators should remain plugged in when not in use. Regarding crash carts, do you have any evidence of the efficacy of equipment when monitored by RNs versus other healthcare professionals (i.e., unit secretaries performing equipment checks on defibrillators). That data does not exist to my knowledge, but data to the contrary also doesn't exist. Many, particularly smaller practices cross train non-medical personnel. Testing a defibrillator requires no medical knowledge. It is simply following a very distinct set of directions and writing down the results, as such requires no medical decision making and places no person at risk. Newer questions are being answered and posted to this page. Please email us at support@acls.net and we will be happy to answer any other questions you have. Our goal is to help the most people, please share this page on a medical forum you use, this means a lot to us.